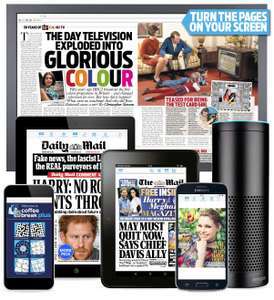 Get the digital edition of the Daily Mail and Mail on Sunday for just £1 for next 3 months. Coffee Break Plus — play 26 fantastic puzzles every day, play against the clock or enter the prize crosswords straight from the app! Cancel at any time. Subscription renews in month four at £10.99 per month. Being digital means it doesn't even have the value of being able to line the cat litter tray with it. I cancelled my subscription before subscribing. Next week they are serialising 'Mein Kampf' for its loyal readership. excellent,have read mein kampf though.